We usually think of handwriting as a solitary task – an interplay between the child’s thoughts, their hand, and the paper. But there are three very special friends who play an integral part in the handwriting process. They need to be acknowledged, they need to be nurtured, and they need to be used. 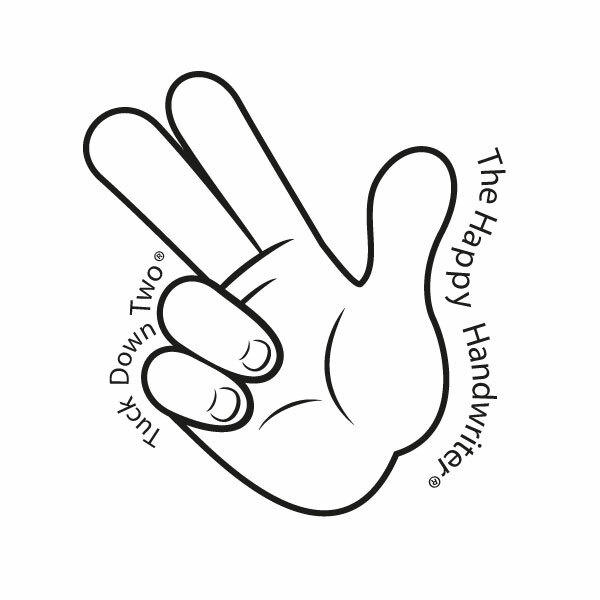 These are the three fingers that hold the pencil and are critical when considering finger exercises for handwriting. The-three-friends® – the thumb index and middle fingers – also have two other friends: the tuck-down-two®, or the fourth and fifth fingers. Years back in my occupational therapy practice, the tuck-down-two were called the rascals. That was until one child’s father misheard, and through we were calling them the assholes! So the tuck-down-two they became and, along with the interplay with the-three-friends, (and, it goes without saying, all the other supporting structures) they are together responsible for the development of speed and legibility of handwriting. I always say that handwriting should have been called finger writing. Because, it is the finger movement that is critical to developing handwriting fluency and speed. 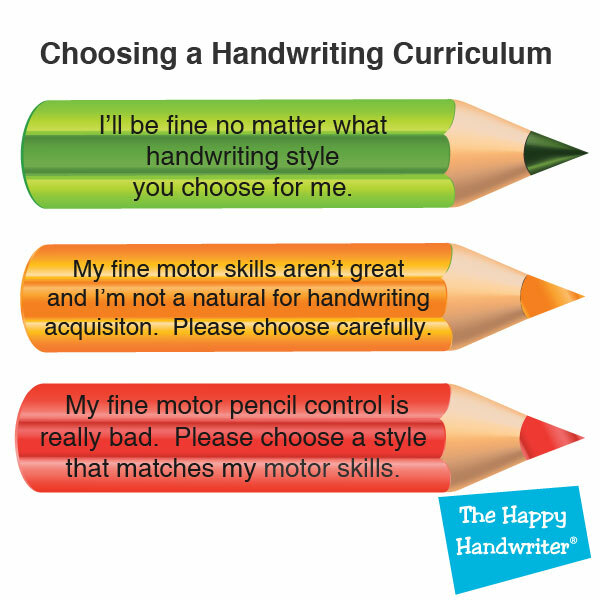 We don’t want handwriting movement to be initiated primarily from the hand, wrist or arm. And we most definitely want the arm resting on the table. 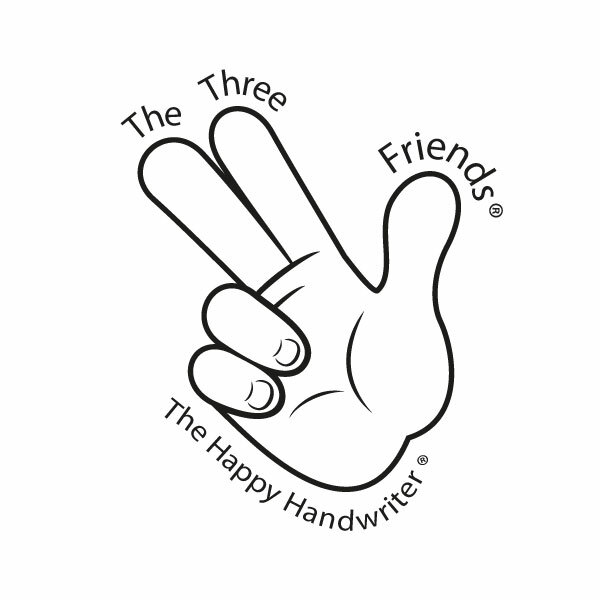 For the fingers to move the pencil efficiently, they need to achieve a balance between the-three-friends. The tuck-down-two provide stability – a base from which the-three-friends can move. So while the tuck-down-two are loosely bent into the palm of the hand quietly providing stability in the background, the-three-friends are getting a workout. The unique balance of pressure exerted by each of these friends, ensures they move as a unit, co-operating all the time as their bend-stretch movements form lines and circles in specific sequences, to form letters. The pads of the-three-friends hold the pencil and the balance of pressure between the three is evenly balanced so they move as a cohesive unit. Let one of them make some kind of adjustment, and you have upset this unique balance which facilitates the discrete refined finger movements. Together, they provide the gold standard in pencil grips – the dynamic tripod pencil grip. But, as we have noted before, efficiency of pencil grip is not defined by how the grip looks, but by whether or not finger movement is achieved. So, if the-three-friends and tuck-down-two get slightly out of sync, but the discrete refined finger movements remain intact, then we have an efficient pencil grip. So we now have three friends and two other friends, and we need to nurture and develop them. This involves providing opportunities to use them in fun, purposeful fine motor skills activities that require their use to succeed. Enter the Learning Resources tweezers – both the Jumbo Tweezers for Grade R and up, and the Gator Grabbers for the little hands of younger children. The Gators have oval markings for placement of the-three-friends, while the Jumbos have perfectly positioned indentations and are ideal fine motor skills for preschoolers. They are best held as though holding a pencil, with the top end of the tweezers pointing out the back of the hand. And then picking and placing is the name of the game. Our Gator Grabber tweezers are paired with the Groovy Animals which can be picked up and sorted. They may then go on to be joined together by matching the grooves. The Avalanche Fruit Stand game is an all time hit with the children. They simply can’t get enough and that makes it an outstanding game. The Jumbo Tweezers are required to play the game and that means the-three-friends are getting a work out. We also have the Jumbo Tweezers paired with sea animals and dinosaurs which can be picked up, sorted and placed – all requiring graded use of the Jumbo Tweezers. Cutting is another of my favourite activities to activate the-three friends while the tuck-down-two are quietly providing stability in the background. Even if you have tried cutting before and it hasn’t worked out our Learn to Cut bundle takes the pain out of teaching your child to cut. Everything is there. 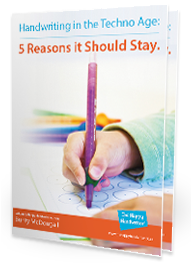 There is no guess work and your child will soon be on the path to cutting success – and the-three-friends will thank you! So the-three-friends and the tuck-down-two are my best friends when it comes to finger exercises for handwriting. Give the-three-friends a workout and they will prepare the muscles to manipulate the pencil, which goes a long way to ensuring that we develop the speed and quality of handwriting. Pop over to Grange Park Primary School for their finger exercises for handwriting tasks.